(Nanowerk News) Like fingerprints, no 3D printer is exactly the same. That's the takeaway from a new University at Buffalo-led study ("PrinTracker: Fingerprinting 3D Printers using Commodity Scanners") that describes what's believed to be the first accurate method for tracing a 3D-printed object to the machine it came from. 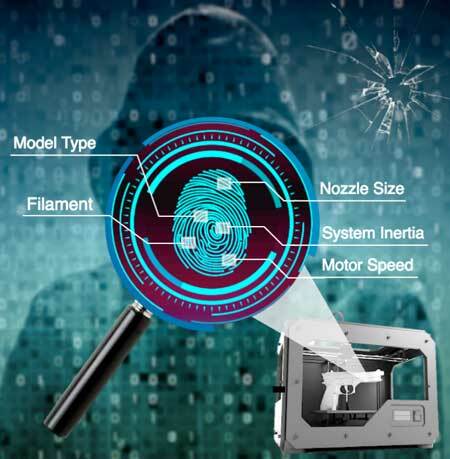 The advancement, which the research team calls "PrinTracker," could ultimately help law enforcement and intelligence agencies track the origin of 3D-printed guns, counterfeit products and other goods. "3D printing has many wonderful uses, but it's also a counterfeiter's dream. Even more concerning, it has the potential to make firearms more readily available to people who are not allowed to possess them," says the study's lead author Wenyao Xu, PhD, associate professor of computer science and engineering in UB's School of Engineering and Applied Sciences. The study will be presented in Toronto at the Association for Computing Machinery's Conference on Computer and Communications Security, which runs from Oct. 15-19. It includes coauthors from Rutgers University and Northeastern University. To understand the method, it's helpful to know how 3D printers work. Like a common inkjet printer, 3D printers move back-and-forth while "printing" an object. Instead of ink, a nozzle discharges a filament, such as plastic, in layers until a three-dimensional object forms. Each layer of a 3D-printed object contains tiny wrinkles -- usually measured in submillimeters -- called in-fill patterns. These patterns are supposed to be uniform. However, the printer's model type, filament, nozzle size and other factors cause slight imperfections in the patterns. The result is an object that does not match its design plan. For example, the printer is ordered to create an object with half-millimeter in-fill patterns. But the actual object has patterns that vary 5 to 10 percent from the design plan. Like a fingerprint to a person, these patterns are unique and repeatable. As a result, they can be traced back to the 3D printer. "3D printers are built to be the same. But there are slight variations in their hardware created during the manufacturing process that lead to unique, inevitable and unchangeable patterns in every object they print," Xu says. To test PrinTracker, the research team created five door keys each from 14 common 3D printers -- 10 fused deposition modeling (FDM) printers and four stereolithography (SLA) printers. With a common scanner, the researchers created digital images of each key. From there, they enhanced and filtered each image, identifying elements of the in-fill pattern. They then developed an algorithm to align and calculate the variations of each key to verify the authenticity of the fingerprint. Having created a fingerprint database of the 14 3D printers, the researchers were able to match the key to its printer 99.8 percent of the time. They ran a separate series of tests 10 months later to determine if additional use of the printers would affect PrinTracker's ability to match objects to their machine of origin. The results were the same. The team also ran experiments involving keys damaged in various ways to obscure their identity. PrinTracker was 92 percent accurate in these tests. Xu likens the technology to the ability to identify the source of paper documents, a practice used by law enforcement agencies, printer companies and other organizations for decades. While the experiments did not involve counterfeit goods or firearms, Xu says PrinTracker can be used to trace any 3D-printed object to its printer. "We've demonstrated that PrinTracker is an effective, robust and reliable way that law enforcement agencies, as well as businesses concerned about intellectual property, can trace the origin of 3D-printed goods," Xu says.